Web Power Switch 15 Day Free Trial! - Ships overnight. Smart, reliable, web power control. Automatic reboot. Powerful, yet simple to use. Eight switched circuits, fully programmable. Easy to set up. Local control and status. Order online or call (408) 330-5599 today. Easy to set up. Adds reliabilty. Eliminates down time. Order online now! Used nationwide in datacenters, ATC & E-911. Dual 15A inputs. Battery backed up server. AutoPing reboot. HTTPS, WiFi, Scripting. Eight relays, 18 outlets. Surge suppressed, Double grounding & more. Keeps routers, access points, and servers running non-stop. Handles up to 8 devices. Remote control, reboot, and sequencing. Simple web interface. Universal AC or DC operation. Eight individual circuits. AutoPing. Clock Calendar. Low power. Rock-Solid reliability. Control anything anywhere! Save time. Save power. Eliminate service calls. 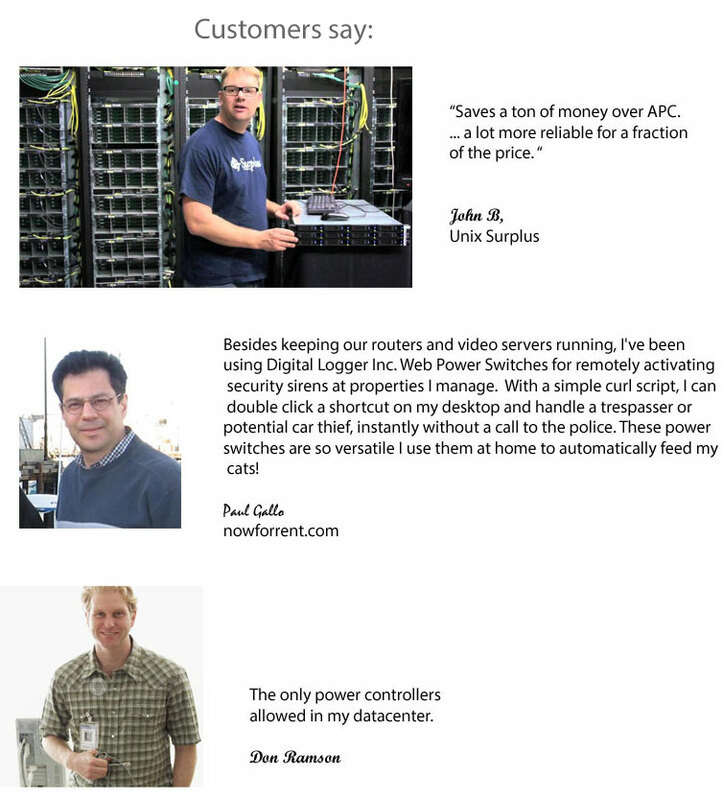 Switch routers, servers, lighting, even industrial machinery via the web! Customize the web server with your own links. Conserve power. Reboot automatically. Do it all securely from any web browser! At DLI, we listen to customers. We've recently improved the keypad, added a removable power cord, added a clock/calendar and a host of new features like scripting and scheduling. Mobile devices, WOL, NTP, and syslog are supported. It's still just as simple to use. Evaluate risk-free for 15 days. Call (408) 330-5599 for quantity discounts, expedited shipping, and international orders. Download a spec sheet, read the FAQs, preview the online manual or Try one live! (user=admin & pass=4321). DLI builds PoE Injectors, Redundant Rack-Mounted PDUs, High power DC controllers, 80-240V controllers and DIN relays. Here's an accessory control relay often used in combination with this switch.